U.S. District Judge Audrey Collins has issued a final ruling upholding L.A.’s ordinance banning all new off-site advertising signs, including digital billboards and supergraphic wallscapes. Judge Collins issued a tentative ruling from the bench two weeks ago in the challenge brought by sign company Liberty Media, but allowed the company’s attorneys time to submit further arguments to support its contention that the ordinance approved by the City Council this past August should be thrown out. In her 30-page ruling, the judge rejected all the arguments made by Liberty Media, a company that erects and maintains multi-story supergraphic signs on the walls of buildings, saying that the city was acting properly under its charter in enacting the new ordinance, which doesn’t allow any exceptions to be granted for off-site signs pending an appellate court ruling in another case, in which Judge Collins declared last year that the city’s 2002 ban on off-site signs and supergraphic signs was unconstitutional because it allowed exceptions for sign districts, specific plans, and development agreements. Amen to the first statement. As to the second, since former City Planning Commission president Jane Usher came on board the City Attorney’s office and a billboard task force was set up there, the efforts to enforce regulations and stop scofflaw sign companies does appear more diligent and focused. Along with its challenge to the new sign ban, Liberty Media had asked Judge Collins to grant an injunction barring the city from citing it for illegal signs at 16 sites around the city. The judge denied that request. 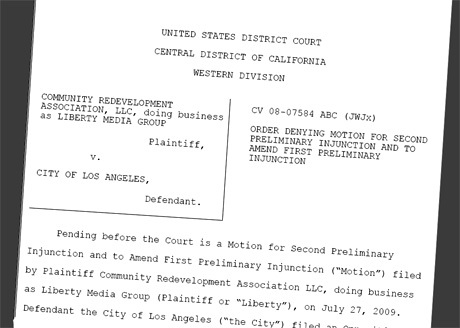 Will Liberty Media appeal the judge’s decision? Stay tuned.